Arthur Nebe (help·info) (13 November 1894 – 21 March 1945) was a key functionary in the security and police apparatus of Nazi Germany and a Holocaust perpetrator. Nebe rose through the ranks of the Berlin and Prussian police forces to become head of Nazi Germany's Criminal Police (Kripo) in 1936, which was folded into the Reich Main Security Office (RSHA) in 1939. Prior to the 1941 German invasion of the Soviet Union, Nebe volunteered to serve as commanding officer of Einsatzgruppe B. The killing unit was deployed in the Army Group Centre Rear Area, in modern-day Belarus, and reported over 45,000 victims by November 1941. In late 1941, Nebe was posted back to Berlin and resumed his career within the RSHA. Nebe commanded the Kripo until he was denounced and executed after the failed attempt to kill Adolf Hitler in July 1944. Following the war, Nebe's career and involvement with the 20 July plot were the subject of several apologetic accounts by the members of the plot, who portrayed him as a professional policeman and a dedicated anti-Nazi. The notions that Nebe's motivations were anything other than Nazi ideology have since been discredited by historians who describe him as an opportunist and an "energetic", "enthusiastic" and "notorious" mass murderer driven by racism and careerism. Born in Berlin in 1894, the son of a Berlin school teacher, Nebe volunteered for military service and served with distinction during World War I. In 1920 Nebe joined the Berlin detective force, the Kriminalpolizei (Kripo; Criminal Police). He attained the rank of a police inspector in 1923 and the rank of Police Commissioner in 1924. Nebe was a "conservative nationalist", who embraced the shift of the country "to the right in the 1930s". In July 1931, he joined the Nazi Party (NSDAP number 574,307) and the Schutzstaffel (SS number 280,152). Nebe became the Nazis' liaison in the Berlin criminal police, with links to an early Berlin SS group led by Kurt Daluege. In early 1932, Nebe and other Nazi detectives formed the NS (National Socialist) Civil Service Society of the Berlin Police. In 1933 he came to know Hans Bernd Gisevius, then an official in the Berlin Police Headquarters; after the war, Gisevius produced an apologetic account of Nebe's Nazi era activities. In 1935 Nebe was appointed head of Prussian Criminal Police. He later obtained the rank of SS-Gruppenführer, an SS equivalent to the rank of a police general. From left to right: Franz Josef Huber, Nebe, Heinrich Himmler, Reinhard Heydrich and Heinrich Müller, November 1939 in Munich. In July 1936, the Prussian Criminal Police became the central criminal investigation department for Germany, the Reichskriminalpolizeiamt. It was amalgamated, along with the secret state police, the Geheime Staatspolizei (Gestapo), into the Sicherheitspolizei (SiPo), with Reinhard Heydrich in overall command. Nebe was appointed head of the Reichskriminalpolizeiamt, reporting to Heydrich. The addition of the Kripo to Heydrich's control helped cement the foundations of the police state. It also led to an "overlap" of personnel from the SD, Gestapo and Kripo to leadership positions in the police and security forces in Germany. 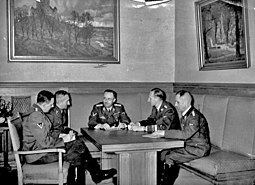 On 27 September 1939, Himmler ordered the creation of the Reich Main Security Office (Reichssicherheitshauptamt or RSHA); the new organisation encompassed the intelligence service, security services, secret state and criminal police. The RSHA was divided into main departments, including the Kripo, which became Department V of the RSHA. Department V was also known as the Reich Criminal Police Office (Reichskriminalpolizeiamt, or RKPA). Kripo's stated mission, which Nebe embraced, was to "exterminate criminality". Under his leadership, equipped with arbitrary powers of arrest and detention, the Kripo acted more and more like the Gestapo, including the liberal use of so-called protective custody and large-scale roundups of "asocials". In 1939, Nebe lent a commissioner in his Criminal Police Office, Christian Wirth of Stuttgart, to the euthanasia organisation, which ran the programme of involuntary euthanasia of the disabled. Also in 1939, as head of Kripo, he was involved in the discussions around the upcoming campaigns against the Sinti and Roma. Nebe wanted to include sending Berlin's Gypsies to the planned reservations for the Jews and others in the east. In October 1939, Nebe ordered Adolf Eichmann to put Gypsies with Jews on the transports to Nisko. Just prior to the 1941 Nazi invasion of the Soviet Union in Operation Barbarossa, the Einsatzgruppen mobile death squads which had operated in Poland were reformed and placed once again under the overall command of Reinhard Heydrich. Nebe volunteered to command Einsatzgruppe B, which operated behind Army Group Center after the invasion of the Soviet Union. The unit's task was to exterminate Jews and other "undesirables", such as communists, Gypsies, "Asiatics", the disabled, and psychiatric hospital patients in the territories that the Wehrmacht had overrun. The Einsatzgruppen also shot hostages and prisoners of war handed over by the army for execution. Around 5 July 1941, Nebe consolidated Einsatzgruppe B near Minsk, establishing a headquarters and remaining there for two months. The killing activities progressed apace. In a 13 July Operational Situation Report, Nebe stated that 1,050 Jews had been killed in Minsk, and that in Vilna, the liquidation of the Jews was underway, and that five hundred Jews were shot daily. In the same report Nebe remarked that: "only 96 Jews were executed in Grodno and Lida during the first days. I gave orders to intensify these activities". He also reported that the killings were being brought into smooth running order and that the shootings were carried out "at an increasing rate". The report also announced that in Minsk Einsatzgruppe was now killing non-Jews. In the 23 July report, Nebe advanced the idea of a "solution to the Jewish problem" being "impractical" in his region of operation due to "the overwhelming number of the Jews"; there were too many Jews to be killed by too few men. By August 1941, Nebe came to realize that his Einsatzgruppe's resources were insufficient to meet the expanded mandate of the killing operations, resulting from the inclusion of Jewish women and children since that month. In August 1941, Himmler attended a demonstration of a mass-shooting of Jews in Minsk arranged by Nebe after which he vomited. Regaining his composure, Himmler decided that alternative methods of killing should be found. He told Heydrich that he was concerned for the mental health of the SS men. Himmler turned to Nebe to devise a more "convenient" method of killing, particularly one that would spare executioners elements of their grisly task. Murder with carbon monoxide gas, already in use in the Reich as part of the euthanasia program, was contemplated, but deemed too cumbersome for the mobile killing operations in the occupied Soviet Union. One of the bunkers was loaded with explosives and 24 mental patients were put into it. Nebe gave the signal to detonate, but the resultant explosion failed to kill the patients. Several of them emerged from the bunker covered in blood and screaming loudly. Thereupon more explosives were brought up, the wounded patients were forced back into the bunker, and a second explosion finally finished the job. The bunker had become quiet and parts of bodies could be seen hanging from nearby trees. Two days later, Nebe and Widmann carried out another killing experiment: five psychiatric patients from Mogilev were placed in a hermetically sealed room, with pipes leading to the outside. At first, exhausts from a passenger vehicle were vented into the room, so that the carbon monoxide would kill those inside. However, this method failed to kill the patients, so a truck was added; the patients were dead within 15 minutes. Nebe and Widmann concluded that killing with explosives was impractical, while gassing "held promise", as vehicles were readily available, and could be used as needed. After these experimental killings, Nebe thought of remodelling a vehicle with a hermetically sealed cabin for killing. The carbon monoxide from the vehicle's exhaust would be channelled into the sealed cabin in which the victims stood. He discussed the technical aspects of the idea with a specialist from Kripo's Technology Institute and together they brought the proposal before Heydrich, who adopted it. The Wehrmacht's aggressive rear security doctrine, and the use of the "security threat" to disguise genocidal policies, resulted in close cooperation between the army and the security apparatus behind the front lines. Nebe, as the Einsatzgruppe B commander, participated in a three-day field conference at Mogilev in late September 1941. Organised by General Max von Schenckendorff, chief of Army Group Centre's rear area, the conference was to serve as an "exchange of experiences" for the Wehrmacht rear unit commanders. Participating officers were selected on the basis of their "achievements and experiences" in security operations already undertaken. In addition to Nebe, the speakers included: Higher SS and Police Leader Erich von dem Bach-Zelewski; Max Montua, commander of Police Regiment Center; Hermann Fegelein, commander of the SS Cavalry Brigade; and Gustav Lombard, commander of the 1st SS Cavalry Regiment. Nebe's talk focused on the role of the SD in the common fight against "partisans" and "plunderers". He also covered the "Jewish question", with particular consideration to the anti-partisan movement. Following the conference, a 16-page executive summary was distributed to the Wehrmacht troops and police units in the rear area. There was a dramatic increase in atrocities against Jews and other civilians in the last three months of 1941. Under Nebe's command, Einsatzgruppe B committed public hangings to terrorise the local population. An Einsatzgruppe B report, dated 9 October 1941, stated that, due to suspected partisan activity near Demidov, all male residents aged fifteen to fifty-five were put in a camp to be screened. Seventeen people were identified as "partisans" and "Communists" and five were hanged in front of 400 local residents assembled to watch; the rest were shot. Through 14 November 1941, Einsatzgruppe B reported the killing of 45,467 people; thereafter, Nebe returned to Berlin and resumed his duties as head of the Kripo. Following the assassination of Heydrich, Nebe assumed the additional post of President of the International Criminal Police Commission, the organization today known as Interpol, in June 1942. After the Anschluss in 1938, the organization had fallen under the control of Nazi Germany and was headed by Heydrich until his death. Nebe served in this capacity until June 1943, when he was replaced by Ernst Kaltenbrunner. In March 1944, after the "Great Escape" from Stalag Luft III prisoner-of-war camp, Nebe was ordered by Heinrich Müller, Chief of the Gestapo, to select and kill fifty of the seventy-three recaptured prisoners in what became known as the "Stalag Luft III murders". Also in 1944, Nebe suggested that the Roma interned at Auschwitz would be good subjects for medical experiments at the Dachau concentration camp, after Himmler had asked Ernst-Robert Grawitz, a high-ranking SS physician, for advice. Nebe was involved in the July 20 plot against Adolf Hitler; he was to lead a team of twelve policemen to kill Himmler, but the signal to act never reached him. After the failed assassination attempt, Nebe fled and went into hiding on an island in the Wannsee. He was arrested in January 1945, after a former mistress betrayed him. Nebe was sentenced to death by the People's Court on 2 March and, according to official records, was executed in Berlin at Plötzensee Prison on 21 March 1945 by being hanged with piano wire from a meat hook, in accordance with Hitler's order that the bomb plotters were to be "hanged like cattle". Historians have a uniformly negative view of Nebe and his motives, despite his participation in the 20 July plot. Robert Gellately writes that Nebe's views were virulently racist and antisemitic. Martin Kitchen casts Nebe as an opportunist, who saw the SS as the police force of the future, and as an "energetic and enthusiastic mass murderer, who seized every opportunity to undertake yet another massacre". Yet, according to Kitchen, he "was clearly unable to stand the strain and was posted back to Berlin". Comprehensive reports filed by the Einsatzgruppen have been analyzed by historian Ronald Headland as "historical 'Messages of Murder'" that provide insights into the worldview of its leadership. Headland writes that the reports "bear witness to the fanatic commitment of the Einsatzgruppen leaders to their mission of extermination"; their ideology and racism are evident in the "constant debasement of the victims" and "ever present racial conceptions concerning Jew, Communists, Gypsies and other 'inferior' elements". Headland concludes that Nebe was an ambitious man who may have volunteered to lead an Einsatzgruppe unit for careerist reasons, to get a "military decoration", and to curry favor with Heydrich. Any misgivings he may have entertained as to the feasibility of the undertaking failed to prevent him from overseeing the murder of close to 50,000 people in the five months he spent as commander of his unit. Gerald Reitlinger describes Nebe's reasons for joining the Einsatzgruppen as "placation" and a desire to hold on to his position in the Criminal Police Department, which, since 1934, had been "invaded by amateur Gestapo men" and was later taken over by Heydrich. "If Nebe did in fact retain his office till 1944, it was because of the five months he spent in Russia, or, as his friend Gisevius politely referred to, 'at the front'." Reitlinger called Nebe a very questionable member of the Resistance Circle at the time of the great bomb plot. Alex J. Kay writes that "the role, character and motivation of those involved both in planning—and in some cases carrying out—mass murder and in the conspiracy against Hitler deserve to be investigated more closely". He places Nebe in this category, with Franz Halder, chief of the OKH, and Georg Thomas, head of the Defence, Economy and Armament Office in the Oberkommando der Wehrmacht (OKW) (English: Supreme Command). Several apologetic accounts produced by the conspirators behind the 20 July plot described Nebe as a professional police officer and a dedicated member of the German resistance. In 1947, Hans Gisevius described Nebe's position at the head of Einsatzgruppe B as a "brief command at the front". Gisevius changed his story in the 1960s, when Nebe's role with the Einsatzgruppen was exposed. In Wo ist Nebe? (Where is Nebe ), Gisevius claimed that Nebe was reluctant to accept the posting but had been persuaded to take it by the opposition leaders Hans Oster and Ludwig Beck, who had allegedly wanted Nebe to retain a key role in Heydrich's apparatus. Gisevius also claimed that Nebe exaggerated the number of victims in reports to Berlin by adding a zero to the number of those killed. In addition, a Swedish police official active in the Interpol during the war years, Harry Söderman, described Nebe and Karl Zindel [de], a key RSHA figure responsible for persecution of the Roma, in his 1956 book as “professional policemen,... very mild Nazis”. Schlabrendorff claimed that he and Tresckow had convinced themselves that "under the mask of the SS leader lurked a committed anti-Nazi..., who invented pretexts for sabotaging Hitler's murderous orders. We succeeded in saving the lives of many Russians. The Russian population often expressed their thanks to us". [...] According to Schlabrendorff, Tresckow personally brought Nebe to the army group [of conspirators]. Nothing was said about the 45,467 murder victims of Einsatzgruppe B by November 1941, the point at which Nebe returned to Berlin. Gerlach doubts that Nebe falsified Einsatzgruppe B reports to "sabotage Hitler's murderous orders". Gerlach puts Schlabrendorff's claims in the context of bomb plotters' memoirs and "existing discourse" on the opposition group within the high command of Army Group Center: "Especially with reference to the murder of the Jews, [it is said that] 'the SS' had deceived the officers by killing in secret, filing incomplete reports or none at all; if general staff offices protested, the SS threatened them. (...) This is, of course, nonsense." The historian Waitman Wade Beorn writes that "some have argued that [Nebe] deliberately inflated the numbers of Jews he reported killed. Yet all evidence indicates that he was quite content to play his role in Nazi genocide and that his subsequent displeasure with the regime may have stemmed from the imminent Nazi defeat but not opposition to the Holocaust". Bernhard Wehner of the Kripo stated that Nebe was worried the Allies would punish him for his crimes, which was the only reason for joining the resistance. ^ Lewy 2000, p. 204. ^ a b c Browder 1990, p. 57. ^ a b Zentner & Bedürftig 1997, p. 641. ^ a b Biondi 2000, p. 10. ^ Browder 1990, p. 125. ^ Browder 1990, pp. 240, 241. ^ Gellately 2001, p. 75. ^ Gellately 2001, pp. 45–46. ^ Reitlinger 1957, p. 279. ^ Gellately 2001, pp. 107–108. ^ a b c d e Lewy 2000, pp. 204–208. ^ Beorn 2014, p. 98. ^ Headland 1992, p. 74. ^ Beorn 2014, p. 110. ^ Headland 1992, p. 197. ^ Headland 1992, pp. 199–201. ^ Beorn 2014, p. 190. ^ Heberer 2008, p. 232. ^ Rees 2006, p. 53. ^ Dederichs 2009, p. 106. ^ Arad 1987, pp. 10–11. ^ Beorn 2014, pp. 95–96. ^ Förster 1998, pp. 1204–1205. ^ Blood 2006, p. 167. ^ Beorn 2014, pp. 99–101. ^ Headland 1992, p. 94. ^ a b Deflem 2002. ^ Andrews 1976, p. 67. ^ Balfour 1988, p. 164. ^ Shirer 1960, p. 1393. ^ Gellately 2001, p. 46. ^ Kitchen 2008, pp. 235–236, 254. ^ Müller & Ueberschär 1997, p. 223. ^ Headland 1992, pp. 208–211. ^ Reitlinger 1957, p. 237. ^ Kay 2011, p. 156. ^ Lewy 2000, p. 205. ^ Gerlach 2004, p. 129. ^ Gerlach 2004, pp. 128–129. ^ Beorn 2014, p. 270. Andrews, Allen (1976). Exemplary Justice. London: Harrap. ISBN��978-0-245-52775-3. Arad, Yitzhak (1987). Belzec, Sobibor, Treblinka: The Operation Reinhard Death Camps. Bloomington: Indiana University Press. ISBN 0-253-21305-3. Balfour, Michael (1988). Withstanding Hitler in Germany, 1933–45. Routledge. ISBN 0-415-00617-1. Beorn, Waitman Wade (2014). Marching into Darkness: The Wehrmacht and the Holocaust in Belarus. Cambridge, MA: Harvard University Press. ISBN 978-0-674-72550-8. Blood, Phillip W. (2006). Hitler's Bandit Hunters: The SS and the Nazi Occupation of Europe. Potomac Books. ISBN 978-1-59797-021-1. Browder, George C. (1990). Foundations of the Nazi Police State – The Formation of SIPO and SD. University of Kentucky. ISBN 978-0-8131-1697-6. Förster, Jürgen (1998). "Securing 'Living-Space'". In Boog, Horst; Förster, Jürgen; Hoffmann, Joachim; Klink, Ernst; Müller, Rolf-Dieter; Ueberschär, Gerd R. (eds.). The Attack on the Soviet Union. Germany and the Second World War. IV. Translated by McMurry, Dean S.; Osers, Ewald; Willmot, Louise. Military History Research Office (Germany). Oxford: Clarendon Press. pp. 1189–1244. ISBN 0-19-822886-4. Deflem, M. (2002). "The Logic of Nazification: The Case of the International Criminal Police Commission("Interpol")". International Journal of Comparative Sociology. 43: 21. doi:10.1177/002071520204300102. Gellately, Robert (2001). Backing Hitler: Consent and Coercion in Nazi Germany. New York: Oxford University Press. ISBN 978-0-19-820560-9. Gerlach, Christian (2004). "Chapter 6: Men of July 20 and the War in the Soviet Union". In Hannes Heer; Klaus Naumann (eds.). War of Extermination: The German Military In World War II. Berghahn Books. ISBN 1-57181-232-6. Headland, Ronald (1992). Messages of Murder: A Study of the Reports of the Security Police and the Security Service. Associated University Presses. ISBN 0-8386-3418-4. Kay, Alex J. (2011) . Exploitation, Resettlement, Mass Murder: Political and Economic Planning for German Occupation Policy in the Soviet Union, 1940–1941. New York: Berghahn Books. ISBN 978-1-84545-186-8. Kitchen, Martin (2008). The Third Reich: Charisma and Community. Routledge. ISBN 978-1-4058-0169-0. Lewy, Guenter (2000). The Nazi Persecution of the Gypsies. Oxford University Press US. ISBN 0-19-512556-8. Müller, Rolf-Dieter; Ueberschär, Gerd (1997). Hitler's War in the East 1941−1945: A Critical Assessment. New York: Berghahn Books. ISBN 978-1-84545-501-9. Rees, Laurence (2006). Auschwitz: A New History. Public Affairs. ISBN 978-1-58648-357-9. Reitlinger, Gerald (1957). The SS – Alibi of a Nation 1922–1945. Viking Press. ISBN 0-306-80351-8.